Absolutely adorable soft chambray cotton two piece short set. Haute Baby stunning set combines fun and classy into one unique, must have set. 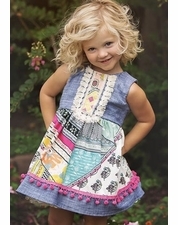 The amazing ivory fringe and the beautiful print on the chambray blue body make this girls set, one of a kind. The top is finished with an amazing pink Pom Pom trim. The blue shorts have a comfortable elastic waistband and the tunic top is comfortable with a loose fit. Runs true to size. 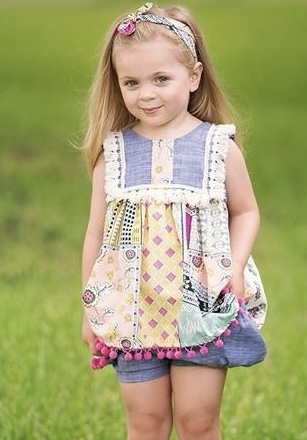 Feel free to call us at 877-767-8579 or email us at sales@adorableschildren.com for specific sizing measurements!